The most influential figure in the musical scene of CUA in the early half of the 20th century. The Tower on May 20, 1924 states: "Without a doubt the wonderful achievements of the Glee Club are due in the greatest measure to the musical genius, untiring efforts, and loyalty of Professor Behrendt. For three years he has coached the boys, week in and week out, doing everything in his power and giving valuable time to the task, that a close-knit and able organization might be the result. One who has kept track of his energetic activity since the time that he was largely responsible for the bringing of the club into existence, does not wonder at its success. The University is greatly indebted to Professor Behrendt for the monumental task that he has performed and too great a tribute cannot be paid to him." From Paul Scimonelli's 2003 Ph.D. dissertation, A History of the Benjamin T. Rome School of Music of The Catholic University of America 1950-2002, pp.13-14: "Mr. Behrendt came to the University in 1913 as an Instructor of German and subsequently became head of the Department of German and Comparative Philology in 1955. He received an M.A. degree in Education in 1914 and the Ph.D in Philosophy in 1926, both from Catholic University. Dr. Behrendt took over some of the vocal teaching from Fr. Gabert early on, but his greatest success was the development of the Men's Glee Club, first organized in 1922, and the University Choir in 1931. Both continued under his direction until 1950. His love of religious music inspired him to compose more than 50 pieces including several Masses. The Glee Club, along with other student groups such as a Barbershop Quartet and later on a Women's Glee Club, comprised some of the music on campus during the first attempts to establish a music school during the late 1920s and early 30s. In 1925, Dr. Behrendt founded the Catholic University Musical Association in an effort to promote monthly concerts on campus. 16 During the 1930s and 40s, Dr. Behrendt and the University Choir provided music for numerous Masses and other liturgical functions held in the National Shrine of the Immaculate Conception (NSIC-CUA). Of particular importance was the Requiem Mass for King Albert of Belgium on February 23, 1934. Dr. Behrendt led a choir of 100 voices. The U.S. Army Band provided military fanfare and performed the Belgium National Anthem along with the Choir. In 1938, he was awarded the Benemerenti Papal Award for outstanding service to the University. He was still teaching when he died suddenly on June 14, 1957." Behrendt was one of the great musical influences at CUA in the years 1920-1925 before Rev. William J. DesLongchamps, Mus. D., became the first instructor in music. 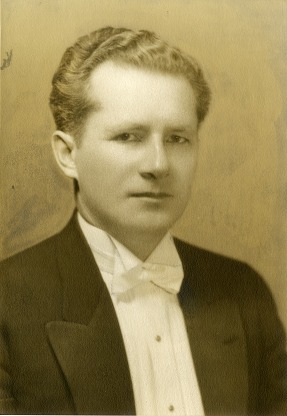 He established CUA's Glee Club in 1920, directing many popular concerts each year and frequently broadcasting throughout the U.S and in Europe on Washington radio stations (first on WCAP and WRC, which shared the same frequency) beginning in 1924, and later broadcasting on WMAL at least during the years 1931-32. A 1924 Tower article states that the Glee Club rehearsed twice a weekâ€”Tuesdays and Thursdays. The first off-campus concert was in 1922. Also in 1922, he formed and conducted CUA's new â€œstringed orchestra,â€ which was unveiled on December 18, 1922, and consisted of four violins, a cello, and a piano. â€œIt is hoped that a bass violin [sic] may soon be added. [Tower 1922-12-18]. It is unfortunate that to date no recordings of the Glee Club have been found. They were tremendously popular and were consistently given praise in articles in The Tower, such as this one from April 27, 1923: â€œThe ability of the Glee Club to put across something extraordinary for the day cannot be questioned. Under its able director, Mr. Behrendt, the club in two years [sic] time has developed into a group that can be compared only with the best clubs of our largest American Universities.â€ The orchestra was taken over by Roland Rutledge in 1925. 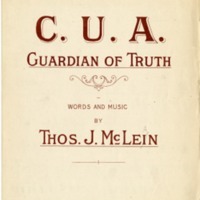 Evidence shows that Behrendt's Glee Club performed the McLean alma mater song ("Guardian of Truth") at many of his concerts, popularizing the piece and perhaps leading to the communal assumption that it is our official alma mater song.